Two years prior to launching their contemporary art museum and foundation headquarters in Los Angeles, Eli and Edythe Broad opened a museum as part of Michigan State University, the Alma Mater of Mr. Broad. Designed by famed architect Zaha Hadid, it officially opening to the public in 2012. The Broads, longtime philanthropists of the arts, have a vast art collection as well as several venues bearing their name, specifically focusing on postwar and contemporary art which has been loaned to various art institutions world-wide. 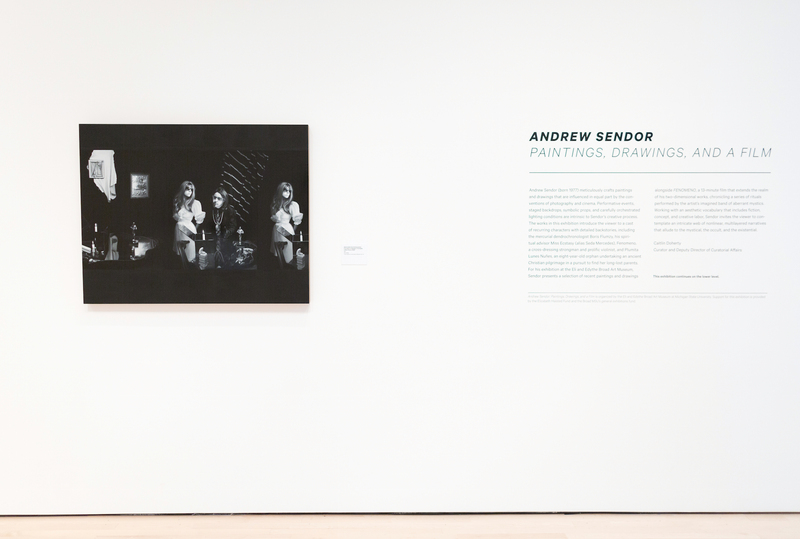 Curated by Caitlín Doherty, Curator and Deputy Director of Curatorial Affairs at the Broad MSU and on view until April 24th, 2016, Andrew Sendor: Paintings, Drawings and a Film, compromises just what the title infers. 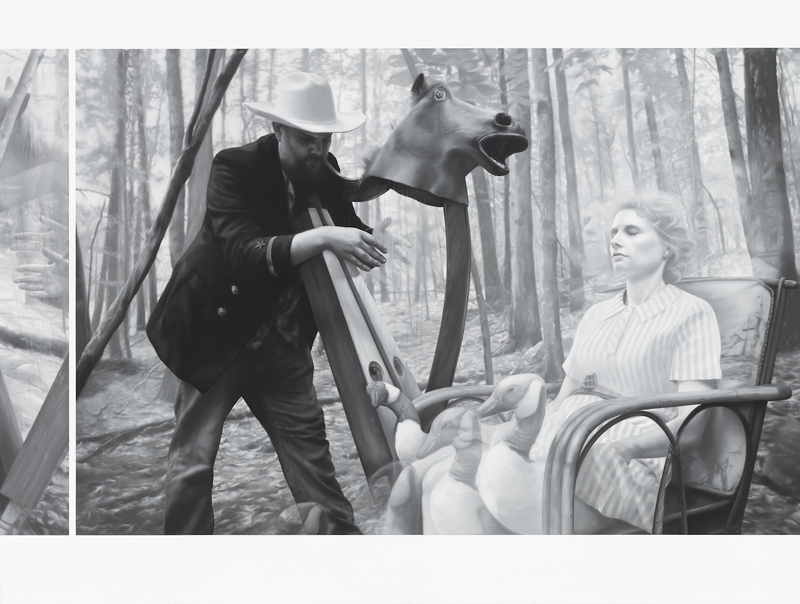 Sendor, who is represented by Sperone Westwater in New York, has a practice that revolves around Magic Realism. For this exhibition he is showing a selection of eight paintings and six drawings along with a 13-minute video titled FENOMENO. While all artists draw their inspiration from different sources, the immediate fountain of inspiration for Sendor, comes from film and photographic work. A diligent draughtsman, one of his dominant interests lies in a cast of characters created around a fictional narrative. Using his own likeness within the complex web he’s made, a protagonist and other cohorts, walk a path not defined by time. They enter and leave what our reality assumes to be, visually complicating a storyline that may or may not exist. The film itself is in brilliant color, while the paintings are somehow further removed, being executed in black, white and gray tones. There is a cinematographic quality of the images, which exist nearly as stills from the film. Nearly because in some cases the figures are rendered in positions that may or may not have occurred in the sequence of images that make up FENOMENO. The philosopher Vilem Flusser wrote, “[the] specific ability to abstract surfaces out of space and time and to project them back into space and time is what is known as ‘imagination. '” “Images are significant surfaces,” Flusser states. “Images signify -mainly- something ‘out there’ in space and time that they have to make comprehensible to us as abstractions (as reductions of the four dimensions of space and time to the two surface dimensions. )” This is, in other words, what a painting is. When looking at the work of Andrew Sendor, another artist who comes to mind is Keith Mayerson. Mayerson, uses paint to cover surfaces, and much like Sendor, the figure is his catalyst. Texturally variant, Mayerson uses many colors and tiny brushstrokes to arrive at his bodily landscapes, but treats the form as just that, a landscape of likeness that can also have visual obstacles changing the viewers relationship to the proposed similitude. Similarly, Sendor paints forms, that we then recognize as people. However, like in Mayerson’s work, some of the faces and positioning of the presented bodies are very subtly distorted, or off, while other details, are rendered impeccably. It is in these cursory realizations, one is almost thrust away from the painting. As with all painting, viewers can become yo-yo’s, springing back and forth from the surface, leaning, squinting and stepping back. If fully engaged, this ping-pong effect can be delightful rather than bothersome as it plays with perceptions of reality. It is also in these moments when taste can be developed. In the case of Sendor, occasionally, the paintings are rendered in a much more direct —regarding expectations— representational manner such as in From the documentary ‘The Tchaikovsky Effect on Fenomeno at the Geirangerfjorden, Norway’, (2014). In said painting, a pantless man, wearing a Huckleberry Finn inspired straw hat and (out of time) fannypack plays a violin and appears even more beautiful than in the original scene from FENOMENO, whence he came. It is in the paintings where the artist seeks to portray beauty beyond what we see, where he shines. It’s what he does best. Rather than explore the space between abstraction and representation in an understated way, his work is most successful when we are left wondering. Rather than focus on proposed missteps in anatomy, we can marvel at technique and an almost phantasmagoric quality in the figures. Sendor has a narrative all his own. He delves into his own understanding or interpretations of what dreams or hell might be like. His characters swerve between life and death, only with minimal hints at their existence. In the 13-minute film, the mysticism reveals itself however still in a way that feels very close to the artist. 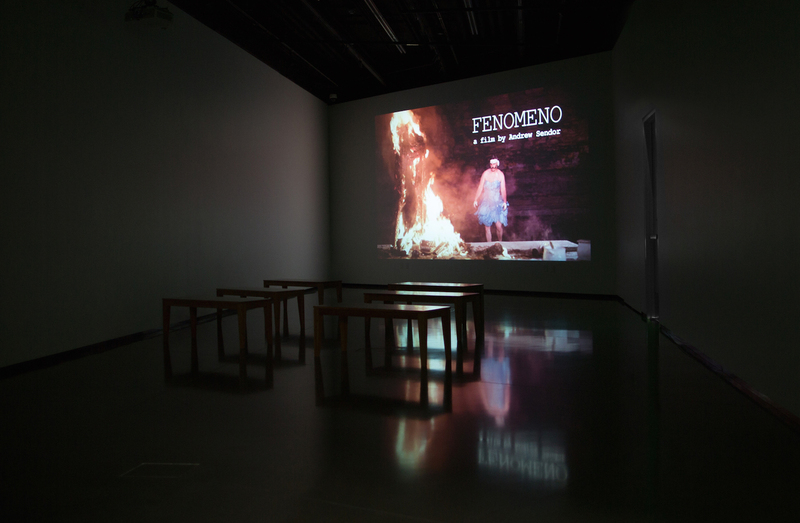 At the Broad Art Museum MSU, the film is projected in it’s own room, on a screen 17.5 feet wide. The paintings and drawings hang nearby. The job of any painter, specifically one that portrays moments of life and death via the body, is to challenge our understanding of time and breath through the power of actualization. At times, this journey can be distorted or ambiguous, however when the artist reaches his or her stride —which in most instances equals truth— the mark is made. When Sendor get’s too theatrical in technique or visual aesthetic, his work is less compelling. Yet, when the paintings tell us more rather than simply portray —or portend— they can be dynamic and imaginative even if less of what Rush refers to be abstract. Andrew Sendor: Paintings, Drawings and a Film is on view at the Eli and Edythe Broad Art Museum, MSU until April 24th, 2016.